where humans define what is natural from their perceptions and memories of the present and very recent past. What is the status of rivers today? Many responses to that question will appear throughout this book, yet a definitive answer is lacking. Global and national assessments are very approximate, but nonetheless indicate that most rivers are influenced by human activities, often to a substantial extent (Revenga et al. 2000). To be sure, some regions are as untouched as one could reasonably imagine, including the great salmon-producing rivers of the Kamchatka Peninsula, remote tropical rivers of the Amazon and Orinoco basins, and a few other places. As new methods of biological assessment are becoming standardized and widely deployed, river surveys are beginning to produce comprehensive evaluations of river health for basins and regions, and eventually these will be stitched together into national assessments of the status and trends of fluvial ecosystems. There can be little doubt that most streams and rivers will continue to face a daunting array of threats. Foremost is the increase in human population in all of its manifestations: urban areas with impervious surfaces and piping, housing sprawl into farmland and increasingly remote areas, and the intensification of agriculture. Often summed up as changing urban and agricultural land use, these trends result in altered supplies of water and sediments and increasing concentrations of nutrients and contaminants. Immediate consequences include habitat fragmentation and degradation, sedimentation, the enrichment of some systems, and the poisoning of others. Tolerant species multiply and spread, and sensitive species decline. 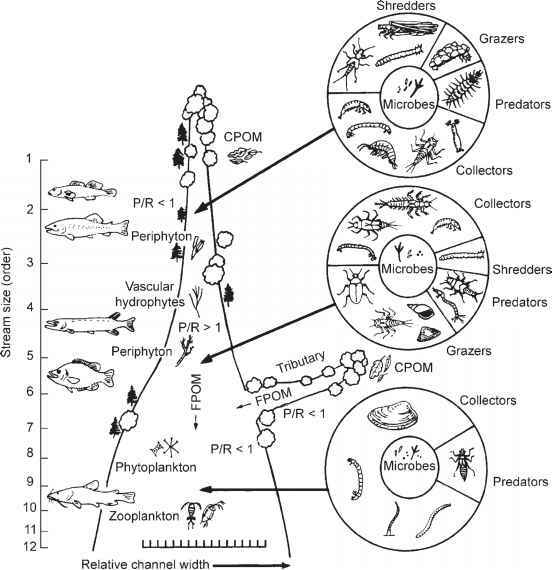 Coupled with the invasion of nonnative species, some of which are very adaptable and thrive in disturbed conditions, the stream biota undergoes simplification and homogenization. Dam construction may actually be on the wane globally, due in part to the recognition of social and environmental costs and in part to the exhaustion of best sites, but for some regions this era is far from over. As concern grows over the ecological effects of climate change, which for rivers portends significant hydrologic impacts, the desire to replace fossil fuels with renewable energy favors more dams on more rivers. In areas that are seasonally or regularly water-stressed, water storage, withdrawal, and transfers exert virtually continuous pressure on river managers to define and defend the water needs of ecosystems against the water needed for human population and development. In order to protect and restore rivers, managers will need recourse to the best science to justify their recommendations, and the public must be informed of the values provided by healthy fluvial ecosystems (Baron et al. 2002). Flowing waters provide critically important goods and services upon which humans depend. This is evident in the protected status that numerous cities give to the catchments that supply their drinking water. The river ecosystem plays a fundamental role in global cycles, transporting water from land to sea, along with vast quantities of sediments, C, N, and other materials. Rivers provide harvestable resources, particularly in Asia and Africa where river fisheries are a major source of protein and employment for large number of people (Allan et al. 2005a). 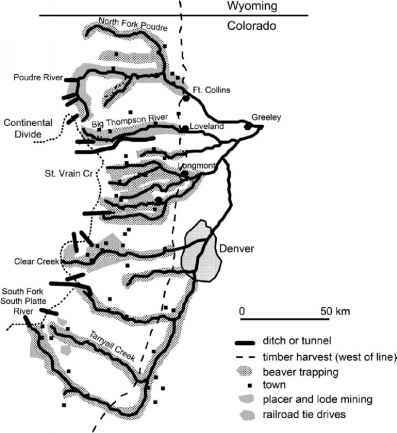 Rivers are transportation corridors and sources of hydropower, providing most of the energy consumed in a number of countries and in some regions of the United States. Rivers provide irrigation water that is critical to crops and livestock. Rivers provide recreation, aesthetic enjoyment, and spiritual renewal. The great challenge facing those who study rivers is to contribute to the reconciliation between the needs of humankind and the needs of the ecosystem. Driven by population and economic growth, human demands can only increase. However, increasing efficiencies, redirection of water to higher priority uses, and an improved understanding of human benefits derived from healthy rivers offer pathways toward a better balance among competing needs. 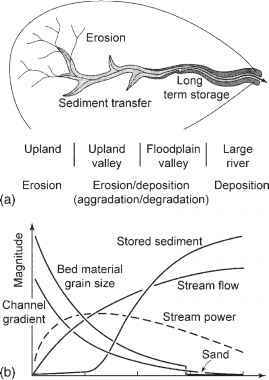 To understand the workings of fluvial ecosystems depends not only upon exciting, conceptual scientific advances, but also on their management, protection, and restoration. We hope that the pages that follow contribute to both objectives.